The New York Chapter of the IPG Women’s Leadership (WLN NY) hosted a special event in collaboration with Changemaker Chats showcasing Emmy-nominated filmmaker Tiffany Shlain’s critically acclaimed documentary 50/50 about the 10,000-year history of women and power. This event was part of a bigger movement of thousands of organizations across the country who viewed this mold-breaking film at the same time. After the 20-minute film, a diverse panel of accomplished women discussed what it would take to achieve a gender-equitable work place and society. 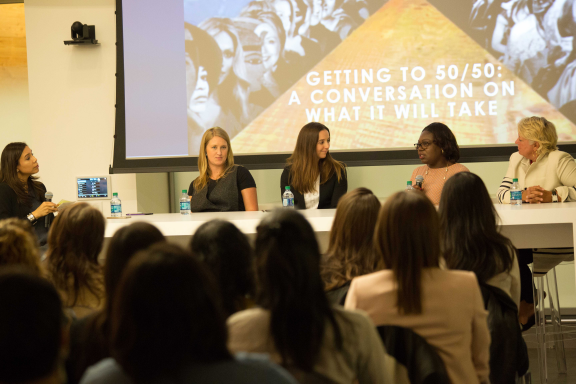 Panelists included top IPG women such as Sally Preston, Chief Media Officer, Orion Worldwide; Geline Midouin, Global Chief Talent Officer McCann Health; Rachel Donovan, Executive Creative Director, Jack Morton Worldwide; and Erin Rech, Head of Digital, Initiative. The discussion was moderated by WLN NY Co-Chair Dawn Terrazas, Executive Group Managing Director, AFG&. Conversation topics ranged from personal philosophies on mentorship, to nontraditional roles for women at home and work, to strategies for creating more diverse and inclusive workplaces.. This is the third time WLN has partnered with Changemaker Chats, a global organization co-created by McCann Global Health VP, Briana Ferrigno that aims to equip women with the networks and know-how necessary to develop careers with power and purpose.